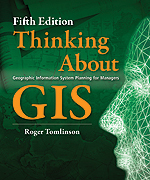 Esri Press has released the fifth edition of Thinking About GIS: Geographic Information System Planning for Managers. This seminal book on planning and implementing a GIS is authored by Dr. Roger Tomlinson, widely recognized as "the father of GIS." The fifth edition has been updated with new resources including case studies, tips, and terminology definitions that reflect the latest advances in GIS technology and information. The accompanying DVD includes examples and templates, exercises, and videos of the seminar "Planning and Managing a GIS" from the 2012 Esri International User Conference.